Designed around the cobolt blue colour of the Tardis this bracelet has various charms relating to the TV Series. 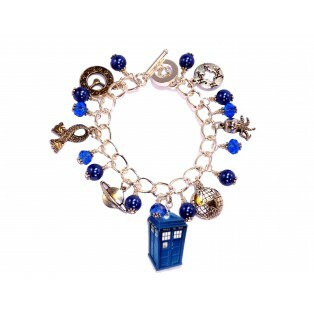 I must point out that the Tardis charm is flat, not 3D and made of acrylic. All the silver charms are Tibetan silver and I have added cobolt blue glass pearls and crystals to accentuate the Tardis. The bracelet is a nickel free chain with a T-Bar fastener and measures the standard 7.5 inches long. If you would like this bracelet made longer or even shorter then please request the exact length at checkout and I will make one for you to fit.